Mary Jannette Cunningham, 88, of Tampa, Florida, formerly of Raymond and Hillsboro, died on March 25, 2019 at 4:44 a.m. in Tampa. Visitation will be held on Saturday, March 30th from 3-4 p.m. at Bass Patton Dean Funeral Home, Hillsboro, IL. A memorial service will follow at 4:00 p.m. at Bass Patton Dean Funeral Home, with the Rev. Randy Sands, Pastor of the Free Methodist Church in Hillsboro, IL, officiating. Born June 17, 1930 in Harvel, Illinois to parents Harry and Laura (Brown) Garard. 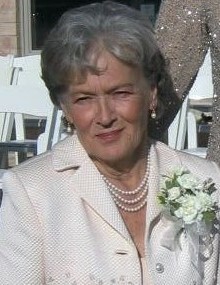 She married Harold Gene Cunningham on June 17, 1957. Harold preceded her in death on December 10, 2009. She is survived by her and Harold’s daughter, Gina Nelson and son-in-law, Dale with whom she lived, in their home in Tampa, since Harold’s passing. Mary is also survived by Mary’s daughter, Sandra Clinton and husband George, grand-daughter, Vanessa Lewis and husband, Les and great-grand-children, Brooke and Rhett. Mary attended school in Raymond, Illinois. After marriage, Mary and Harold lived in Hillsboro and then moved many times due to Harold’s job with Ball Containers. Mary had her real estate license and was also a retail manager. Her passions were raising her children and going to Morgan horse shows where they had many horses compete and win. They retired to South Carolina and then moved to Brooksville, Florida in 2007. Mary was preceded in death by her four siblings, Ruby Hitchings, Bernice Jacobs, Harold Garard and Forrest Garard. Memorials are suggested to American Morgan Horse Association, “Friend of the Morgan” fund in honor of Mary J. Cunningham, Evergreen Lane Morgans.